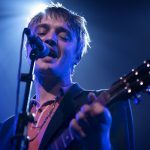 As Peter Doherty brought the first of his Live & Acoustic gigs to Hanger 34, Getintothis’ Howard Doupé was there to continue the fanboy saga. 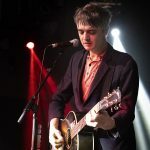 Well, it’s been a howler today this wind – not too dissimilar to how one may describe many a live Peter Doherty solo gig. We’ve seen them all – the belle of the ball to the beauty of the beast. Still, rumbling back into town for the first time in what feels life a lifetime, the curiosity fails to wane. 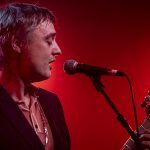 Go back a mere fifteen years and memories can be recalled of witnessing a chaotic early Babyshambles gig unfolding in an old working man’s bowling club in Wigan. Needless to say, the locals weren’t prepared and neither were the bouncers. It was bedlam, but obviously the closest we’d got to a modern-day punk-inspired hoo-ha. Which Peter are we going to see tonight? The modern-day poet, full of lovelorn lament? That spellbound doe-eyed gleam of charisma? Or the wastefully drug-wrecked talent that once primed half of British rock’s great hopes? We’d have to see the support before we get any answers. 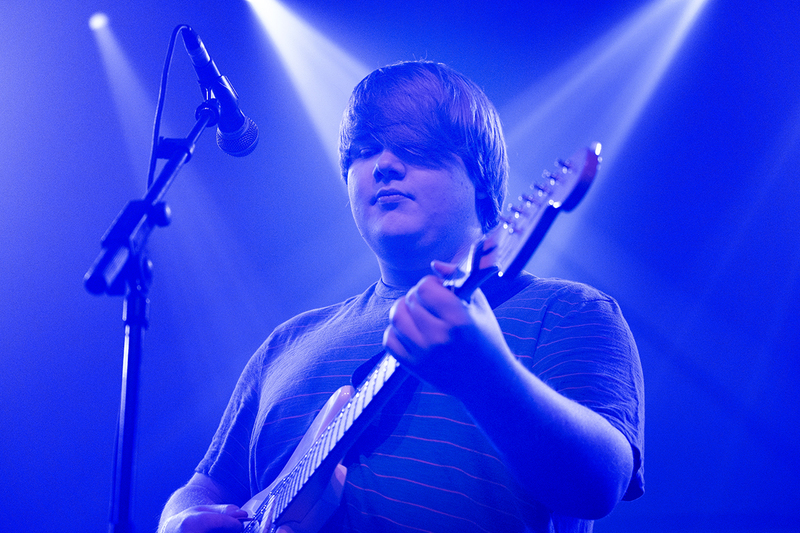 After a triumphant show at last month’s Deep Cuts, Bill Nickson follows it with this support slot tonight. Not too bad eh for this fringe-armed rising star. Unassumingly his band take to the stage. A little premature the PA tunes are turned down and we’re left silently watching Nickson tune up for which he apologises. Straight into the trademark slacker college-rock sound. The influences are evident with more than a nod to the other Bill from across the Mersey. The nerves are in show tonight, there’s little stage movement from any of the band. 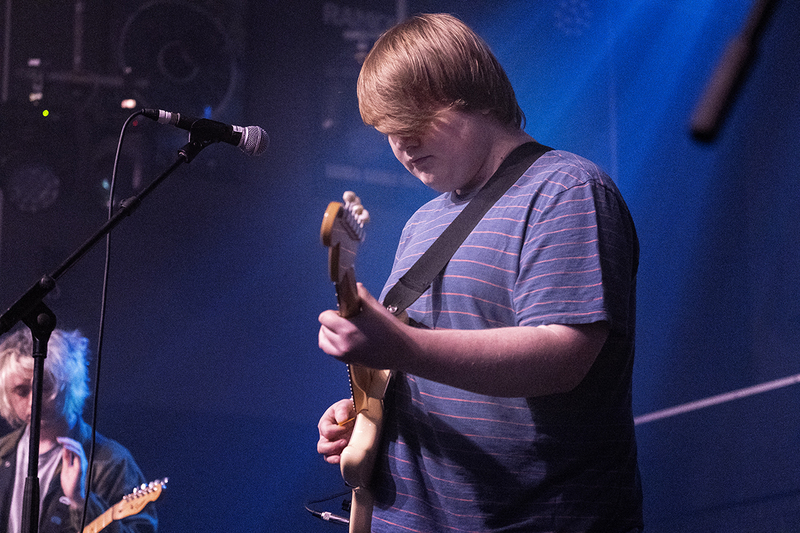 But, what lacks in a stage show is more than made up by the catchy surf-kissed vibes, with hook after hook coming forth. 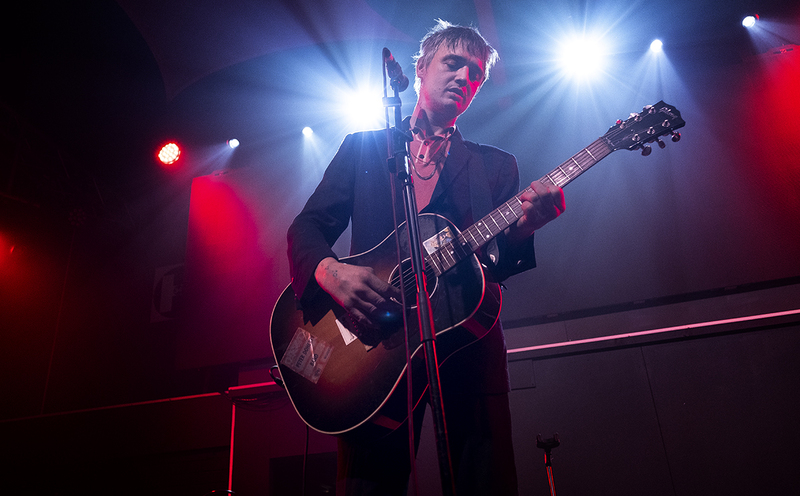 Some nifty fret work from the guitarist who looks like he’s nicked his style from a fictional Combat-Rock / Can’t Stand Me Now era Peter Doherty – if, back in the day he’d reached for the hair bleach, instead, mind you. 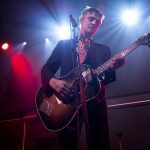 It’s fair to say the crowd are warmly receptive to respect what we’re witnessing – an artist at the infancy of his career and creativity. 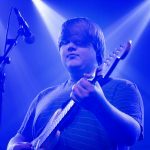 An awkward jolt happens right at the end of the set where Nickson puts down his guitar whilst the band look like they’re the last to know the set’s over. With a polite wave and a Thanks, all exit stage left as quietly as they entered. There is plenty of promise and Nickson might just be worth keeping an eye on over the next few years. Won’t hurt will it? In the blink of a stage clearance it’s suddenly filled up, the PA timely plays Don’t Look Back Into The Sun and the noise in the room whooshes up. All eyes forwards, the anticipation is choking the available air. 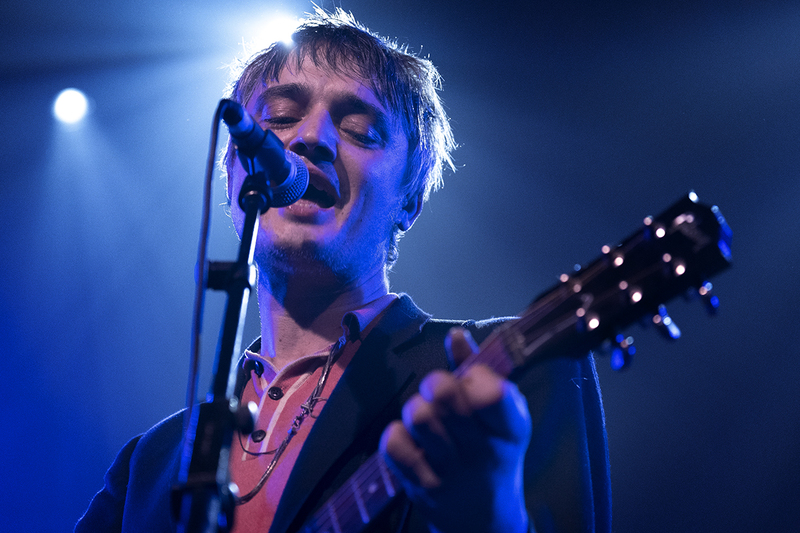 Doherty wanders on, on time and focused straight into The Libertines classic What a Waster. A military hat is thrown onstage and briefly sits atop his head – tonight Doherty’s the born entertainer. Dressed in a well-worn suit, a little pepper-potted these days, it’s obvious after all these years of visiting this city he’s still yet to discover that Scouse could be on the rider. There’s a gracious nod to Cosmic Scouse band The Bandits with a cover of The Warning, albeit sadly largely unknown for the majority of tonight’s crowd. Don’t worry, as a born performer the mood is read and quickly rescued back to full-engagement with Gunga Din from The Libs last release 2015’s Anthem For Doomed Youth. 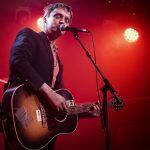 As the next crowd projectile – a QPR shirt – reaches its target – a little banter ensues about not playing live since a little charity gig in Cardiff (December). 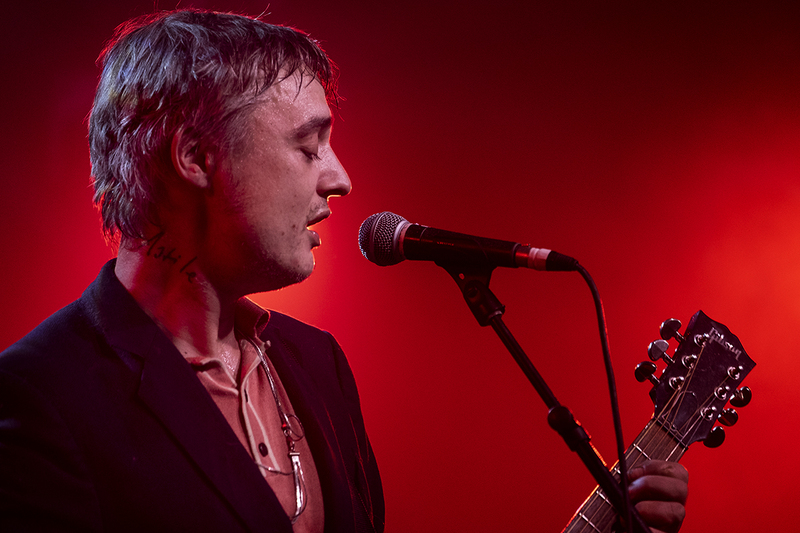 Doherty mentions hearing the crowd singing of I Wish (the ska/reggae influenced track from Babyshambles’ The Blinding EP) which he ‘Googled’. The crowd ain’t gonna let him not do it. They love it. Along with new song Steamboat that set’s played twice. 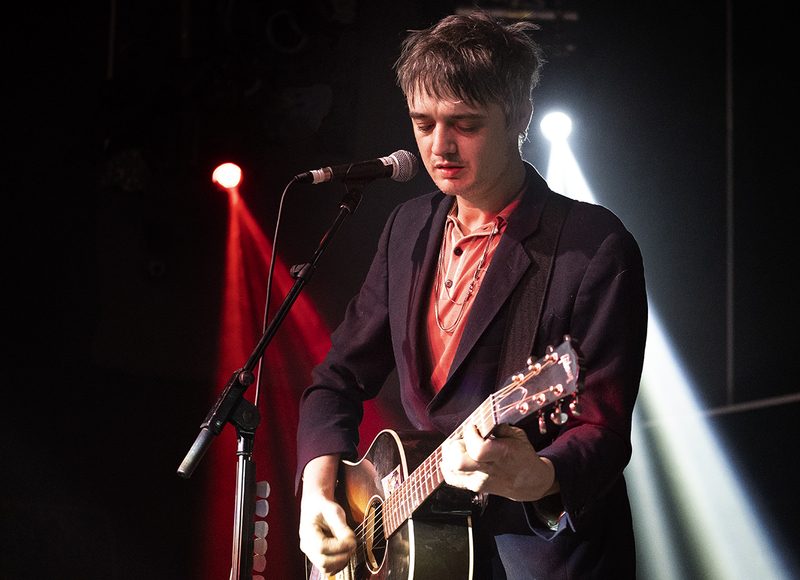 Merry Go Round is delivered with an air of nostalgia, a brief waltz though the Doherty history books, a tender breeze though the delicate imagery. 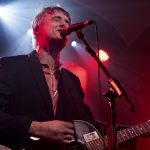 Back to the belters with Time for Heroes – the forever anthem for the eternal French Dog Blues brigade. The coda guitar replaced with some theatrical harmonica playing is the first euphoric moment of the night. All of a sudden, a stage invasion ensues, however, it’s nothing that could have ever been predicted. 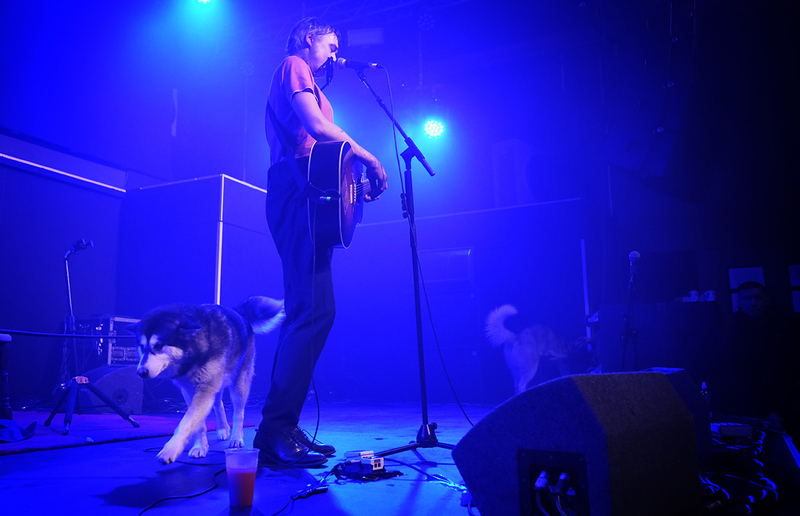 Jaws drop all over the show as unbelievably two Siberian Huskies calmly pad on to the stage and proceed to wander to their hearts content. Who’s done the H&S on this one?! 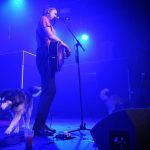 Doherty, like a proud parent starts the canine serenade with solo cut Arcady and early Libs cut Breck Road Lovers. Maybe a touch of stage fright in front of such an adoring crowd only Zeus hangs around for a few tunes more. 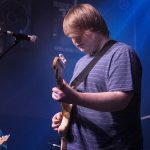 For all these years that have passed since the heady tabloid days, there is a glimpse of potential to become one of Britain’s greatest loved songsmiths. 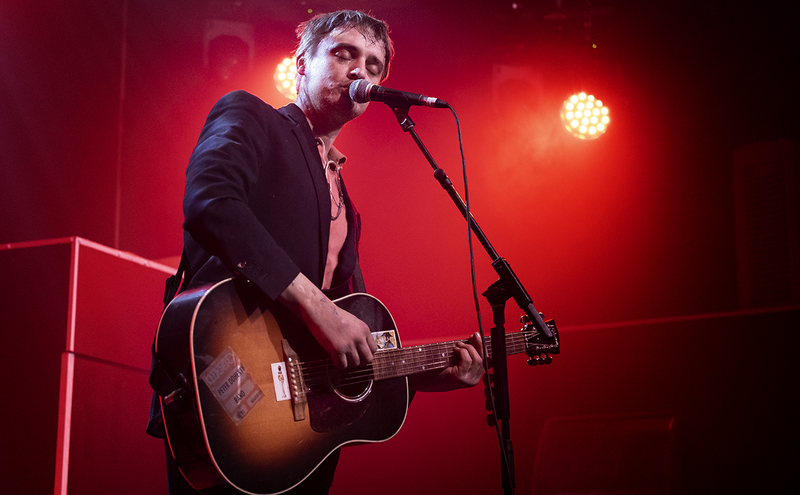 In twenty-odd years’ time will we be holding Doherty up with the Bacharach’s of this world? 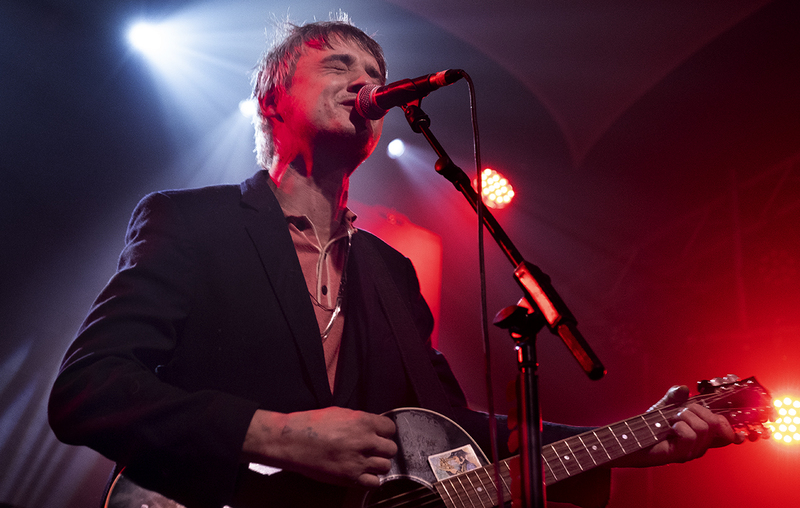 Do these tunes have the calibre to become our nations classics? If evidence was required for the jury the swagger-fuelled delivery of What Katy Did firmly agrees. Even throughout Death On The Stairs you can picture it being belted out by a Dionne Warwick copycat backed by a twenty-five piece philharmonic orchestra, gleamingly filmed for a Saturday night TV special. He’s well on the way, and maybe he knows it as Music When The Lights Go Out ingeniously blends effortlessly into Sandie Shaw’s (There’s) Always Something There To Remind Me. Well played Peter, well played.